On December 27, 1831, the young naturalist Charles Darwin left Plymouth Harbor aboard the HMS Beagle. For the next five years, he conducted research on plants and animals from around the globe, amassing a body of evidence that would culminate in one of the greatest discoveries in the history of mankind-the theory of evolution. Darwin presented his stunning insights in a landmark book that forever altered the way human beings view themselves and the world they live in. 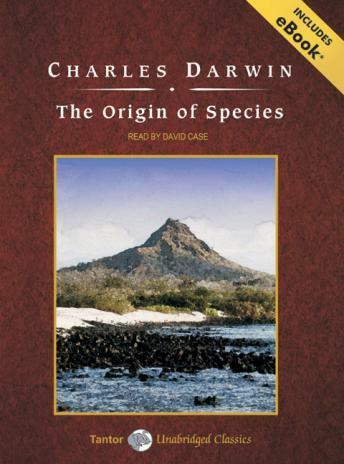 In The Origin of Species, Darwin convincingly demonstrates the fact of evolution: that existing animals and plants cannot have appeared separately but must have slowly transformed from ancestral creatures. Most important, the book fully explains the mechanism that effects such a transformation: natural selection, the idea that made evolution scientifically intelligible for the first time. One of the few revolutionary works of science that is readily accessible to the nonscientist, The Origin of Species not only launched the science of modern biology but has also influenced virtually all subsequent literary, philosophical, and religious thinking. Engaging in that it shows a brilliant mind at work. This is pathbreaking science expressed by a great communicator, and Darwin’s prose is economical, effective, at times even beautiful. That said, despite having no complaints with the audio presentation, I would not recommend Origin Of Species in audio form. The book remains precise, rigorous science – not polemical entertainment on creation vs. evolution. For example, listeners seeking a debate on the descent of man from apes will find none of that here. Since it requires attentive study, Origin Of Species probably is better suited for paper than audio.